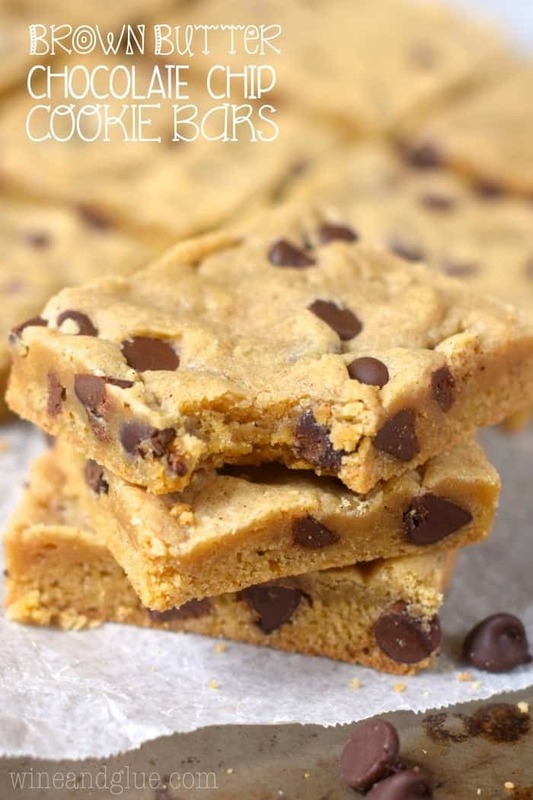 These Brown Butter Chocolate Chip Cookie Bars are insanely good! Like you cut off a slice and then suddenly the whole pan is gone good! If you’ve never made brown butter before, watch the video in this post to see how to make brown butter. 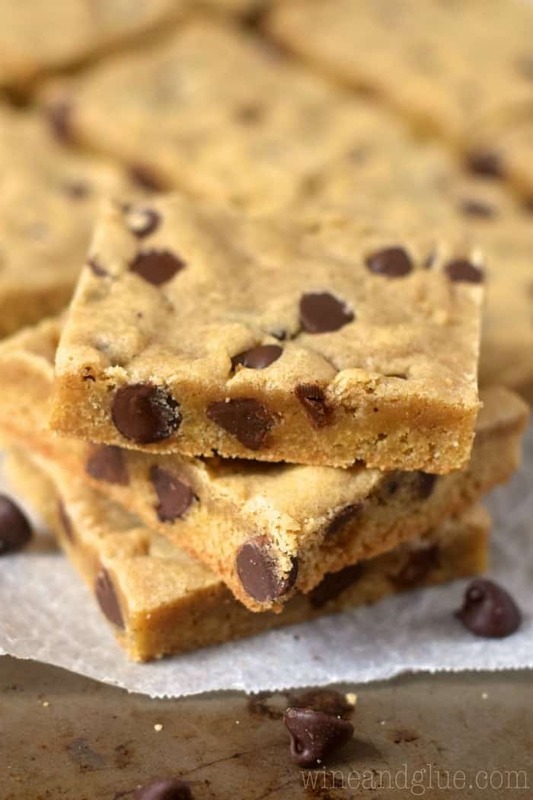 It tastes amazing and adds such a richness to this chocolate chip cookie bar recipe. 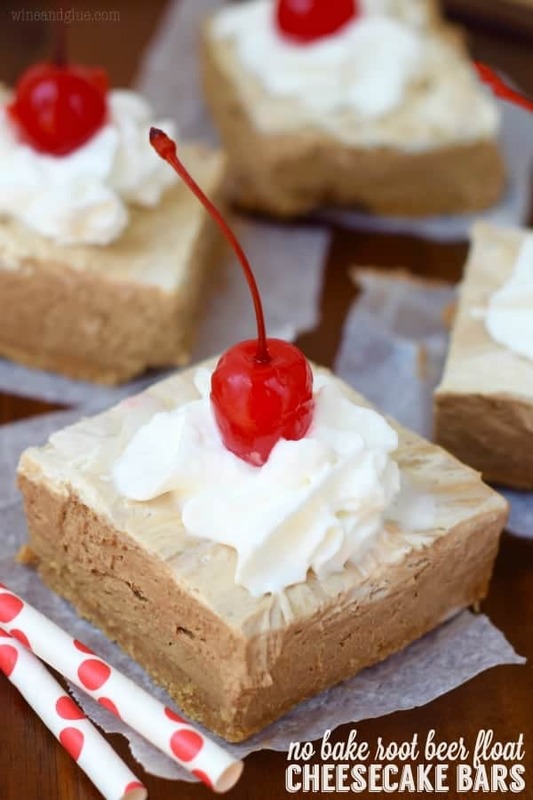 If you are looking for other great cookie bar recipes make these sugar cookie cookie butter bars, these vanilla cookie cookie bars, or these amazing sugar cookie fudge bars! I totally just deleted what I was about to write to all of you in this post. I was trying too hard to be funny. I have spent the last 8 years growing people. And I’m pretty sure that a good 50% of the energy it took to grow those people was expended in the last three days. You guys. My baby is eating me out of house and home. I’m too exhausted to be funny. Is it proven that brown butter increases milk production? Because for the first time in my world renowned nursing career, I’m like seriously under producing. If brown butter could increase production, I would be golden. I promise you that at some point my blogging will become less about nursing toils and tribulations and more about brown butter. You know what, that’s not a promise that I can make. Because as soon as it stops being about nursing its going to be about how hard it is to stay out of 4 year old girl drama. And then it’s going to be about why tween boys stop talking to you altogether. And all sorts of other nonsnese I can’t even fathom yet. But brown butter. I can say that there will be more brown butter mixed in there. This is the first recipe I’ve made with it, and we are now BFFs. Like, super tight. We are even talking about going ring shopping. It takes a recipe that is already really good and takes it to a place where your mouth wants to close up shop because it knows that you are never going to eat something better. I think it’s time to brown butter all the things. Allow it to melt completely, stirring consistently. Once it has melted, it will start bubble, foam and deepen in color. Continue stirring. When brown bits begin to show up at the bottom, remove from heat and allow to cool a little before using in the recipe. Make sure you baking powder and baking soda are fresh. They need to be changed out every six months. To test them add a little baking powder to water – it should bubble immediately. To test the baking soda, add it to vinegar. It should bubble immediately. Make sure not to over measure your flour. Do not use your measuring cup to measure the flour. Scoop it from the container into your measuring cup and then level off. 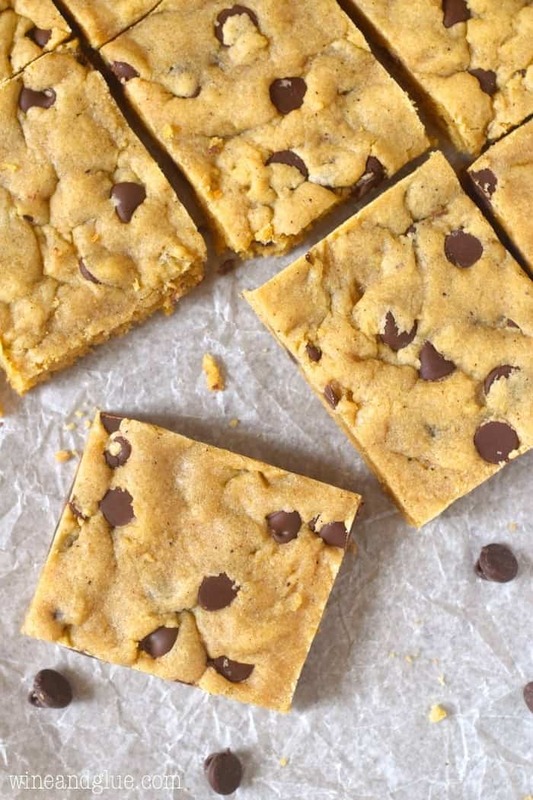 These Brown Butter Chocolate Chip Cookie Bars are insanely good! 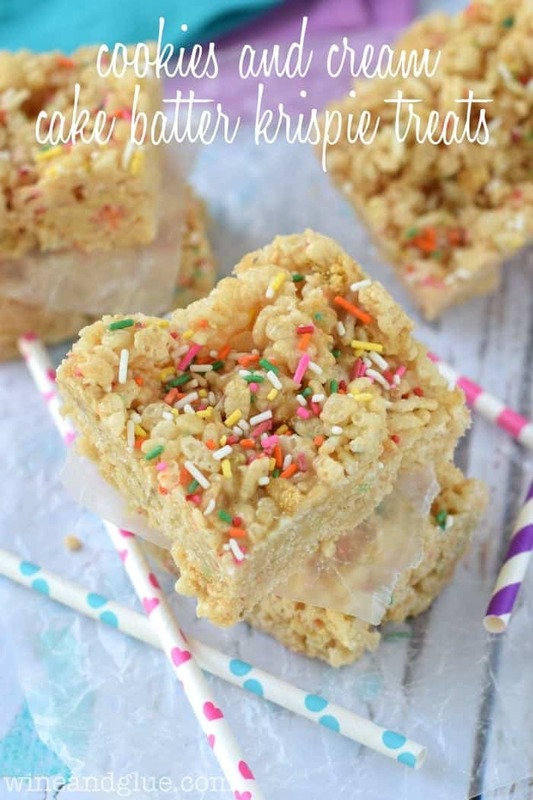 Like you cut off a slice and then suddenly the whole pan is gone good! Preheat the oven to 350 degrees. Spray a 9 by 13 inch pan with cooking spray and set aside. Over medium heat in a skillet melt the butter, stirring consistently. The butter will begin to foam and deepen in color and smell nutty. When small brown bits begin to show up at the bottom, remove it from the heat and allow to cool a little. In a large bowl, mix the flour, salt, baking soda, and baking powder together. In the bowl of a stand mixer, mix together the granulated sugar, packed brown sugar, and brown butter together until fully combined. Add in the vanilla and then each egg one at a time until just mixed. Slowly add the flour mixture, scraping down the sides as necessary. Mix until just combined. With a spoon stir in the chocolate chips. Press the dough into the prepared pan and bake for 20 minutes or until the edges just begin to turn golden brown. Allow to cool completely before cutting and serving. Brown butter and beer, chica! Lots of both. Well, if you pump and dump. But that wouldn’t help you, either. Seriously, I feel for you. I had three babies in 4 years, and I’m just now starting to think that maybe I’ll sleep someday again. But you have these to sustain you. They look SO good. Ugh. It’s so good to know that others have been there! I totally understand the nursing drama! I seriously stressed over it for all 4 of my kids. You would think by the 4th, I’d be pretty easy-going, but I always always worried about production. Now these bars could totally make me forget all my worries! They look absolutely delicious! Ahhh man I was totally hoping you were on to something with the browned butter because it would be WAY better than all the other stuff I’ve tried!!! And yes one slice and this pan would be gone in a heart beat! Im sensitive to gluten. Do you think these would turn out the same if gluten-free flour is used? Hi Lauren! I have absolutely no experience in baking gluten free. If you give it a go with gluten free flour, let me know how it goes! I think they are good for about a week in an airtight container. Last a week??? Not if Im around. Bout 2-3 days. 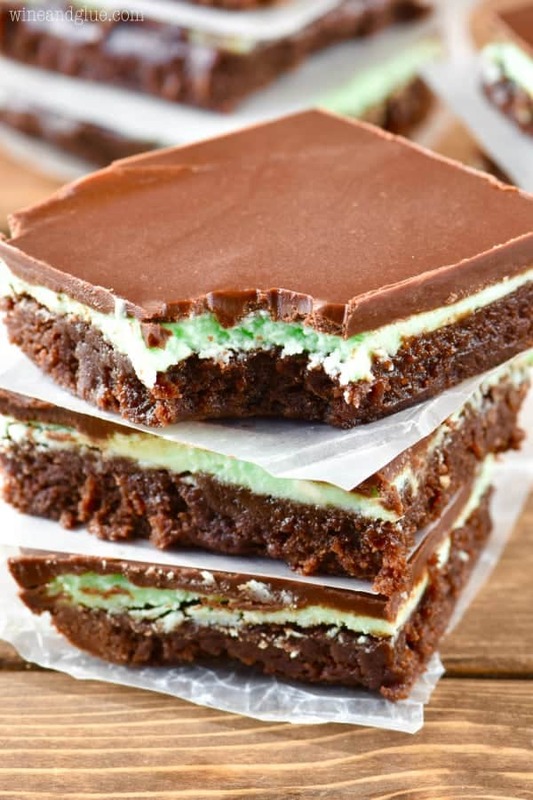 I made these today and they are very yummy! It was my first time making brown butter and I am completely sold… delicious! My only change was to add some cinnamon to the dry ingredients because I add cinnamon to just about everything 🙂 Thanks for the recipe! Meredith, for some reason this comment totally cracked me up! I’m glad you liked them! I made these today. I don’t eat sugar so my taste testers felt there were too many chocolate chips. It made it too gooey. Will try again with less chocolate. Otherwise they said they were delicious. Hmmm, I’m surprised they thought the chocolate chips made it gooey. Did they eat them hot out of the oven? That could explain it. 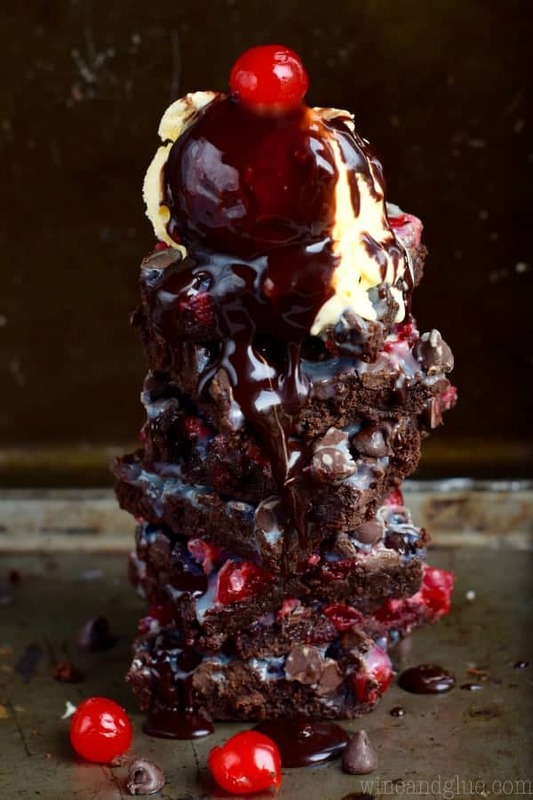 Though in my book there is never enough chocolate chips. I hope you liked them Brittnee! this recipe for how many person????????????? It all depends completely on how you cut them. I typically get 24 bars. Tried this recipe. Used 1/2 cup coconut sugar, 1/4 cup brown, 1/4 cup white. Used mini chocolate chips and added chopped pecans. Super good. Recommend! My turned out kind of almost brownie like in texture. Not sure what I might have done wrong. Like it was cakey, Juliana? Is it possible you added more flour? I got better in my later recipes at specifying this, but you should scoop the flour into the measuring cup and level off from there rather than scooping it out of the container. If you scoop right from the container you can end up with a lot more flour. I have never heard of brown butter? Seriously? I see none with the plain butter at the grocery stores. Help me please! Hi! If you read the recipe, you will notice that you start with regular butter and I walk you through how to brown it. Mine came out dry and cakey. And the chocolate chips were more sparse than in your pictures. I also hand mixed. Does it have to be mixed in the order you specified? 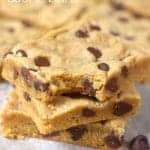 So the biggest reason for dry and bars is too much flour. Make sure with this recipe (and any cookie recipe on my blog) that you scoop the flour into the measuring cup and then level off the top. If you don’t do it that way you will likely pack it and get significantly more flour. And yes, you definitely need to go in the order that is laid out in the recipe. Hand mixing really won’t work for the butter and sugar in this recipe as it is essential for the sugar to beat some air into the butter. Hope these tips help! Tell me all the nursing woes! Neither of us are nursing anymore but I will still always listen because dang it’s so hard. haha! Also I’m pretty sure brown butter increases endorphins, therefore increases milk supply. That’s how it works, right? Yes, I use unsalted butter.